These delicious little balls are just so dang yummy! The soft melt-in-your-mouth texture and citrusy tang, with a backdrop of subtle maple syrup, will have you coming back for more. Such a treat it is then, to know that you may munch away with a healthy conscience. Full of flavour but with no refined sugar what so ever, the Coconut Lime Nibbles are simply here to please! These easy peasy dairy-free no-bake nibbles whip up in less than ten minutes, and require a minimum of effort. 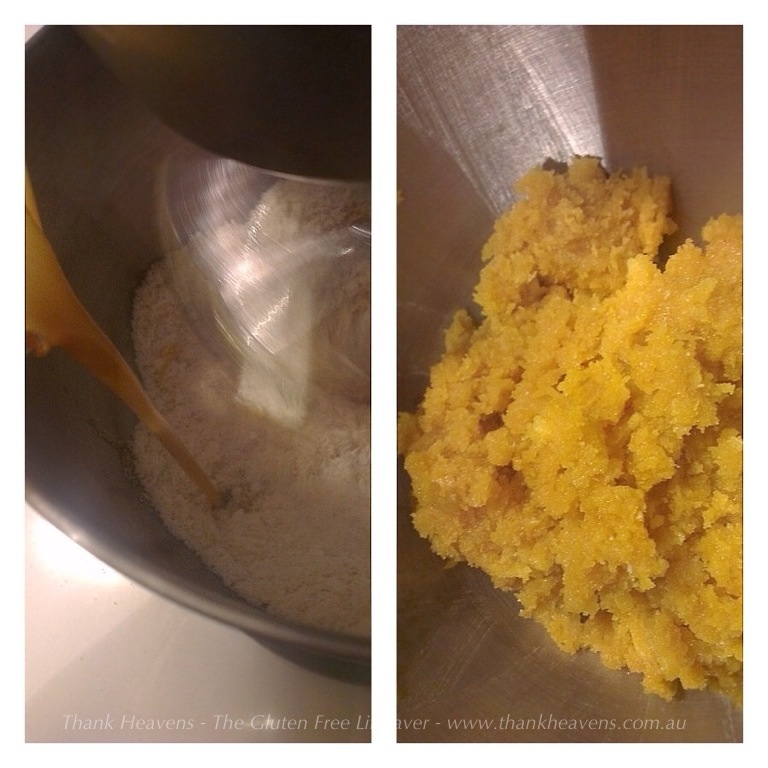 Start by mixing the dry (electric mixer) and wet ingredients separately, leaving out the coconut butter. With the mixer running on slow speed, add the mixed wet ingredients to the dry. Once the batter is well blended, and with the mixer still running at slow speed, pour in the melted coconut butter. The mix will thicken nicely as the butter cools down. If you fancy a bit of colour then separate the mixture into however many colours you are adding (three in my case), and add a tiny little drop of colour to each batch. Be careful, they soon go fluorescent if you go overboard! Less is more (unless you’re aiming for a traffic light effect that is). 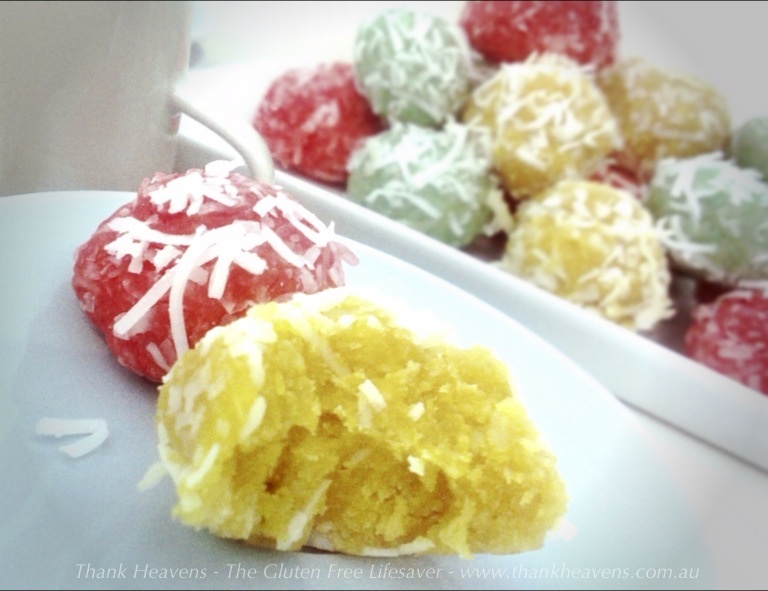 You can use a tablespoon to shape little balls from the mixture, then roll them carefully in soft shredded coconut. The soft coconut is just delicious and will give a very different result than that of the dry version. Once the balls are done, pop them in a lidded container or on a cling-film covered tray, and leave them in the fridge to set. When they have cooled down properly I like to stack them in a smaller container, each layer separated by little sheets of baking paper (or “mellomleggspapir” -a Noggie favorite..) The nibbles will harden slightly, but maintain a soft, chewy texture. Lovely to the last bite! ← Yellow Smoothie – Sunshine and Goodness! Question: what is dessicated coconut, and how is it any different from shredded? Is it not dried? These are such cute cookies, though. I love the recipe, and I think I`m going to try this! Dessicated coconut is dried and finely shredded coconut, and soft shredded coconut is shredded into strips (a bit larger than dessicated) that are not dried. Oh, so it would be the same thing as putting shredded coconut in the processor or blender for a few minutes? I plan to enjoy them, they sound amazing! Yes, I suppose that would work just fine. I strongly urge you to use soft coconut if you can get it though, it really does make a difference! I have been looking for something like these for ages! I can’t wait to make them – I will be doing it this weekend. Glad to have been led to your blog! I’m very happy you like them! Wondering about the soft shredded coconut….is it in a bag? Sweetened? Frozen? And the rice…raw – then mashed up in my Bullet? Personally I use McKenzie’s Moist Flakes of Coconut, which come in a bag and are bought from he baking (or health food) section of the supermarket. However, that’s in Australia (at Coles to be specific) and if you are elsewhere you might have to look for a different brand. That being said, it will work just fine with normal dry coconut too if you have troubles finding soft. Or why not go the extra mile and try fresh coconut? You know, the ones you find in the fruit section? I’m sure that would be even better! As for the ground rice; it is a type of flour that is different from normal rice flour. If you can’t find it then just use coconut flour. I wish we could find better dry coconut here, the selection is lacking – it sounds like you’re able to get your hands on better stuff. All the same, I’m thrilled to try this recipe! I’m keen to hear how you get on! Hi Kendra! I’m excited that you’re going to try the recipe 🙂 You should be able to find coconut butter in a health food store. Perhaps you can use other substitutes, maybe coconut oil (goes solid in cold temperatures so you could store them in the fridge). I buy ground rice in the supermarket (McKenzie’s brand), but you can ask for it in health food stores once again. Almond meal will work just fine! I hope you’ll let me know how you go!